The Beautiful Heresy- Christian Universalism: Sunday Morning Church- Why Bother? Sunday Morning Church- Why Bother? I've been thinking a lot about Sunday morning services for the last year or so. Ever since I went through my "Should I Stay or Should I Go?" series of posts last year this has been on my mind. Since joining Nexus almost 8 months ago now, it's been even more on my mind as I'm unofficially part of the group figuring out how we'll attract and retain people. I think many people still attend church on Sunday morning out of habit or obligation. But, I think in a postmodern world (and especially at postmodern churches), this is going to become a problem. I could see postmodern (emerging, liberal, progressive use whatever adjective you like here) churches struggling to attract people to Sunday morning services, ironically because of the type of people they're trying to draw. People who think and question, will eventually ask the question "Why should I get up on Sunday morning and give up an hour or more of my free time?" After so many years of the canned service of "3 fast, 3 slow, 1 one to pray and 1 to go" (I've heard worship leaders use that phrase or something like it) and the 20 minute PowerPoint fill-in-the-blanks in the program sermons Sunday mornings can become something people dread rather than a time to gather with other seekers and be refreshed. Yesterday morning at Nexus, that was broken through, at least for me. Click here to see some pix of yesterday morning. I've been telling Ty for a while now that while I think Nexus is really good at thinking outside the box, there's something about Sunday morning that is still a little stiff for me. I've discussed this with others at Nexus and it's fascinating to hear the different opinions. Some think the service is already way far from traditional. Others, like me, think it's still too familiar and "churchy". It's stupid to change simply for the sake of change. And I'm sure the traditional format has come to be for many reasons. Having worship songs, followed by a sermon serves several very good purposes. But, my thought has been a few changes here and there could make things a lot better. For example, we generally set up the chairs in a very school-room type style. Well, we don't have straight rows, we angle them in in semi-circles. But, they're rows none-the-less. The general set up is band up front, pastor standing in front of us "students" all sitting in our rows and getting the information dump. Gregg has left time for "talk back" at the end (which I sit waiting for, racing ahead, trying to come back is great practice at being in the present moment). But, the talk back is in its own compartmentalized space. Two things I've been saying (to Ty) I'd like to see are a different seating arrangement and the freedom to talk back during the sermon. I remember when I first saw/heard a "emerging" church service one of the things that struck me about that one was the pastor sat in the middle while people were arranged in living room chairs and couches around him. His talk was interactive, inviting feedback during his talk and the whole thing had such a comfortable feel to it (even though I was only there via video). There's a PodCast I listen to weekly, 21st Century Buddhism by Ethan Nichtern. I look forward to it every week. I never miss it. Every time I listen, I wish there were a meeting like that near me that I could attend. Ethan kicks off the talk with a few minute intro to the topic, there's some (not necessarily a lot) of interaction during that time, then, it's open for discussion. The talks are generally about an hour long and are focused on very practical things. Even when they're discussion a Buddhist truth like "Buddhists should not kill." that people could easily pass over and say "I don't kill.". Ethan always takes it to a very practical, pragmatic, "how does this effect my daily life?" level. Nexus doesn't have big comfy couches and I don't see us sitting in the Lotus position on cushions. But, what I've thought is we could arrange the chairs differently (maybe in a circle or semi-circle around Gregg). Also, have each person put their own chair out and take it back at the end. Each week we set up way too many chairs meaning someone has to show up early to set them up. Everyone is very good about pitching in to put them away at the end. Ty hasn't understood why I find the changes I'd like to see important. In her mind they're pretty insignificant. She doesn't think rearranging the chairs is a big deal. And, she really doesn't participate much even when we have the talk back time. But, yesterday, we had the chance try out things kind of the way I'd like to see them. Nexus had an event called a "Free Slam" on Saturday evening. It's an open mic situation where people could get up to read poetry, sing, juggle, whatever they wanted to do to express themselves. That, I thought, was a really cool thing in itself. But, one of the unintended consequences of that was when I got there to set up chairs on yesterday morning, the chairs were sitting at round tables. The tables were covered with tablecloths and had candles on them. On the floor up front was a rug with pillows on it. Perfect set up for Sunday morning service I thought and planted the seed that maybe we should just keep it that way. The seed took root and we did. The second thing that came together was Deb was speaking yesterday and had planned for interaction during the message. She kicked it off by introducing the topic, leaving space for a moment of silence to reflect on the topic, by saying her piece about it and then inviting us to discuss it. We then had a lively discussion about being our "authentic selves" and/or living out our faith in the workplace. There was an interactive exercise with a strip of paper (Amish PowerPoint) where we did several things with our pieces of paper to represent the inner life versus the outer life (including making a Mobius strip which some of the people in the group struggled with- that struggle itself allowed for more community as those who "got" it helped those who didn't). Jeff spent his time during the sermon interconnecting several Mobius strips, which Chuck observed was a great model for what a community is really like (or should be like). BTW, Jeff was listening and talking during the discussion. I noticed a lot of people were playing with the paper strips (I was too). It's nice to have something to do with your hands while sitting in a discussion. Deb then wrapped up the discussion, we sang another song and dismissed for the day. What I loved about yesterday is it was really about opening a "collaborative exploration" session more than downloading information to us. I think "collaborative exploration " is what Nexus is all about and is one of the major things that sets us apart. I wonder at Nexus, if being such a different place we'll be plagued by the very nature and/or experience of the type of people we will naturally attract. I've already observed there are people who don't seem to be too interested in making it to Sunday morning services, but they are there for a Pool Party, a picnic in the park, a discussion group on Wednesday or a Free Slam on Saturday night. I think we should do two things to address that: 1.) while still encouraging people to come on Sunday morning, make a conscious effort to allow people to feel like they are a part of Nexus' community and mission without having to come on Sunday. I think there are people who would like to participate with us, on some level, but just ain't gonna come on Sunday. 2.) At the same time, try to make Sunday morning as interesting and compelling as possible because that is the one time a week we do gather as community on a regular basis. I think people should come on Sunday morning. But, they should want to come. In my opinion a service like yesterday morning would be more appealing to the type of seekers that would be drawn to the mission of Nexus. What do you think? I know many of you who read my blog don't attend church at all. The last place you want to be on a Sunday morning is in church. Is there anything that would draw you back to church? If you could design a Sunday morning meeting what would it look like? If there were a place like this Nexus around where I live, a place open to discussion style Sunday Mornings, man, I would be there in a heartbeat tomorrow morning! I love the circle / semi-circle / chairs around tables / couches, etc setup. I haven't been able to find a format like that in years. My dad always wished people would go this route, too. But unfortunately we don't know anywhere with any people open to it. What I would like to see is something like this be successful in a large auditorium with hundreds of people. I definitely think it would be possible. Just look at congress or the senate. They have a large number of people meet in a room and somehow they manage to take turns talking, debating, etc. It's not like it's an impossibility. I think with today's technology it opens up even more possibilities. Say you have a person who stands or sits in the middle and plays the role of the choreographer. They have an iPad and they're keeping an eye on questions and discussion topics rolling in from any number at any given time of the hundreds of other people in the room. The people in the room all have smartphones (in this ideal scenario), and that's how they're silently communicating with the MC. 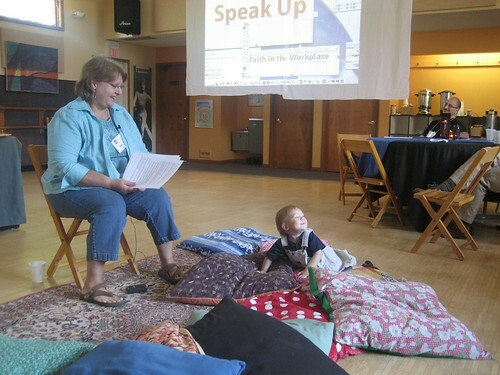 The MC could open with a topic, even give a short sermon, and then start taking questions. Instead of people raising their hands, they're actually typing their questions in ahead of time -- that way, the MC can either call on them, or if it's a simple question, he can just read it and then answer it. There's all kinds of hybrid models that could be built on this general model. I also think that churches should come up with multiple models for their "church services." Think about this. Imagine that you develop twelve different models ranging from open mic, to discussion, to tag-team preaching, to one man sermon preaching, to prayer meeting in a circle, to worshiping with overheads, to spontaneous worship, to you name it. Then you put color code all these models into like flash cards with icons and names and laminate them. You drop them in a hat, and then you pull out one at random, and that's your model for next Sunday! That would keep things feeling new and fresh every Sunday! Or, you all pray and ask the Holy Spirit to lead you in what model you should use next Sunday. Then you take a vote! Whatever model receives the highest vote, you use that. Lee, that sounds great! I'd be there in a heartbeat.